The Semang tribes live (or used to live) in the mountainous interior of peninsular Malaysia where they have lived in close association with a variety of Veddoid and tribal Malay groups. 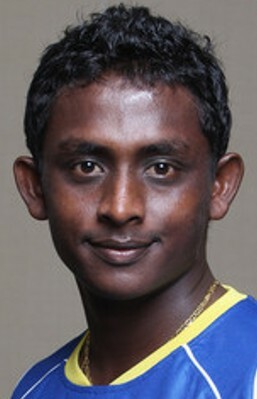 They are, however, physically and culturally much more closely related to the Andamanese Negrito than to their long-term Veddoid neighbours. 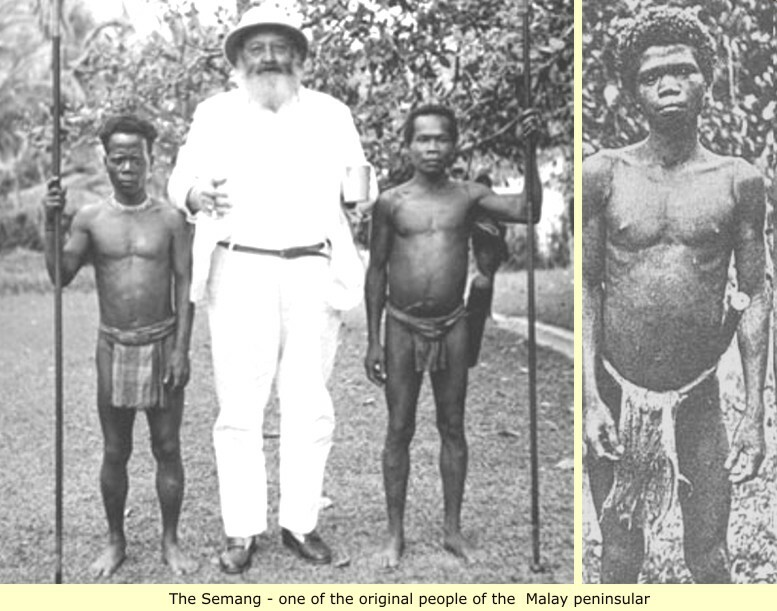 Although they do not seem to have mixed much, their contact was still close enough for them to acquire cultural traits that differentiate them somewhat from the Andamanese. In view of the long separation from each other, it is remarkable how well they have kept their common "Negrito heritage". 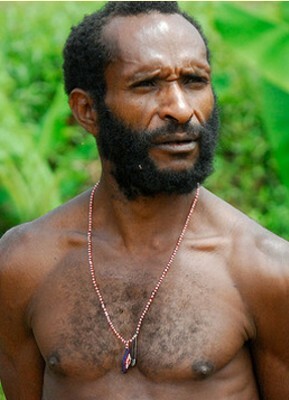 Among Negrito, the Andamanese remain unique for having preserved their original languages. The Semang have adopted the language of the Mon-Khmer wave of migrants surrounding them perhaps since before 7,000 years ago. Some vocabulary suspected of going back to their original language has been recovered. The Mon-Khmer-speakers were themselves pushed aside by Malay newcomers who today dominate the peninsula south of the Thai border. Oddly enough, the Semang and some Veddoid tribal groups have retained their Mon-Khmer languages until recently despite the social and cultural pressures to adopt Malay. Please note: There were many kingdoms in Malaya and the Indonesian archipelago, we are here only going to mention the ones that built great Temples or other such structures. The information that we have is very meager, so please bear with us. 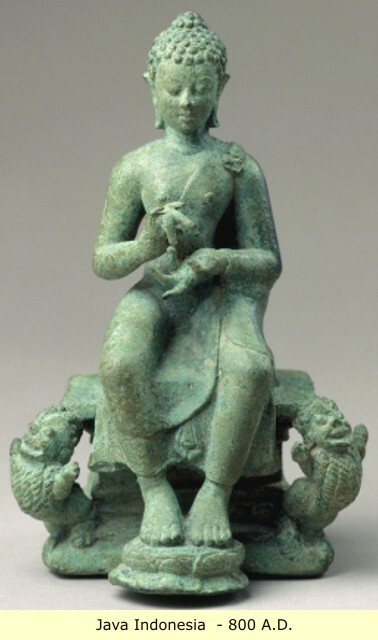 The first of the Indonesian kingdoms that we know anything about, is Srivijaya - which lasted to about 1400 A.D. It was an ancient Malay kingdom on the island of Sumatra. 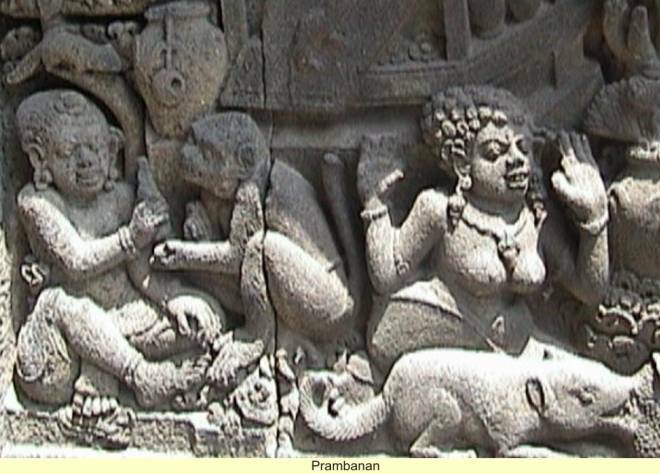 At around 500 A.D, a new Srivijayan center began to develop around the present-day town of Palembang. However it is from Chinese records, that we gather much of what we know. And it is from these Chinese records, dated to about 600 A.D, that we learn that there are two Sumatran kingdoms, one based in Palembang and another based in Jambi. 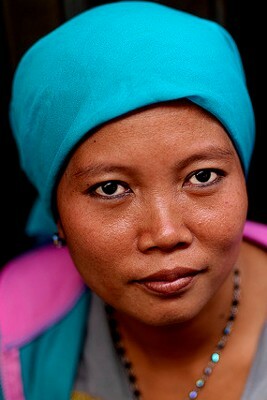 They also mention three other kingdoms on the neighboring island of Java. It seems that the kingdom of Srivijaya was a coastal trading center and a maritime power. But it did not extend its influence, much beyond the coastal areas of the various islands. People of the in-land areas of these islands, were pretty-much unaffected by the Srivijaya. However for those in the coastal areas and river valleys, force was the dominant element in the Srivijaya Empire's relations with them. As a stronghold of "Vajrayana" Buddhism, Srivijaya attracted pilgrims and scholars from other parts of Asia. Included in These was the Chinese monk Yijing, who in 671 and again in 695 A.D, made lengthy visits to Sumatra on his way to study at Nalanda in India. 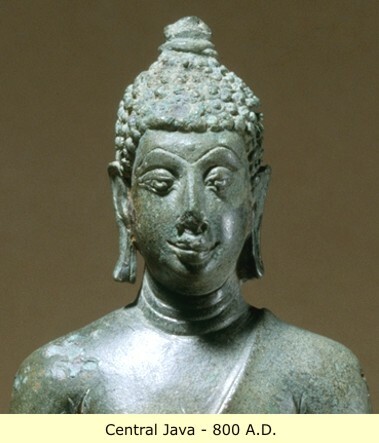 In 775 A.D, the last Srivijaya king retreated to east Java, in the face of the rising power of the central Javanese "Shailendra" kingdom, they were followers of Mahayana and Tantric forms of Buddhism. 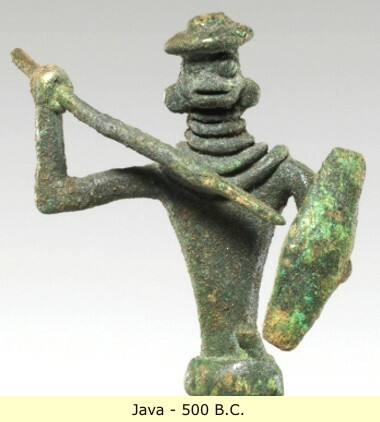 Shailendra (“Lord of the Mountain”), was a dynasty that flourished in Java from about 750 to 850 A.D. - After the fall of the Funan kingdom in Cambodia. 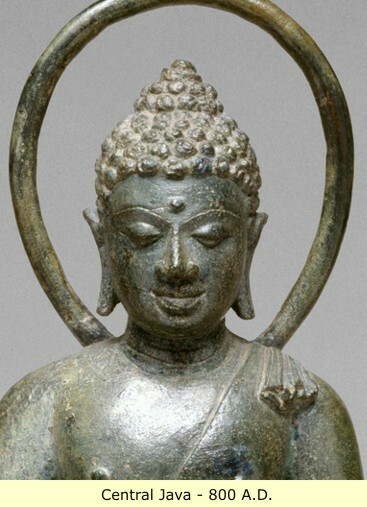 This kingdom was marked by a great cultural renaissance associated with the introduction of Mahayana Buddhism. Java attained its highest level of artistic expression in the many temples and monuments built during this time. 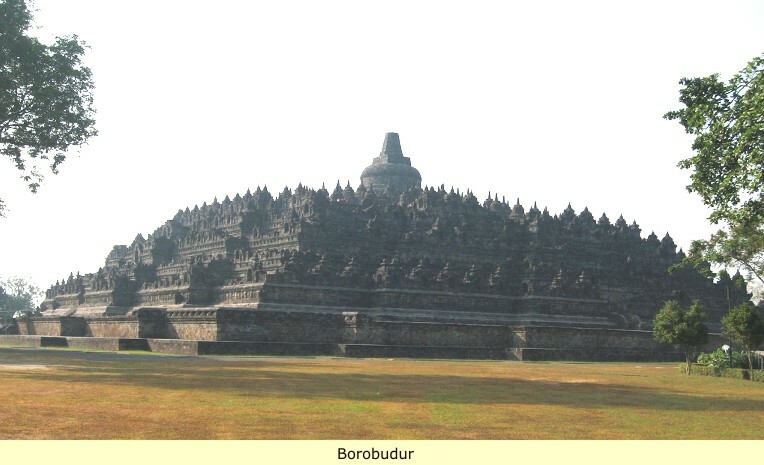 It was during the reign of one of its kings that the famous stupa of Borobudur was built. At Prambanan, on the Island of Sumatra. It is said that it was a king named "Dhaksa" of the Mendang-Mataram kingdom, who in the 10th century A.D. built the largest Siva temple in Indonesia the "Lara Jonggrang" meaning Slender Maiden. This name was affectionately given to a large statue of the Hindu goddess Durga (wife of Shiva), which stands in the temple. Local legend has it, that this statue is actually Javanese princess Loro Jonggrang, who was turned to stone by a spurned suitor. 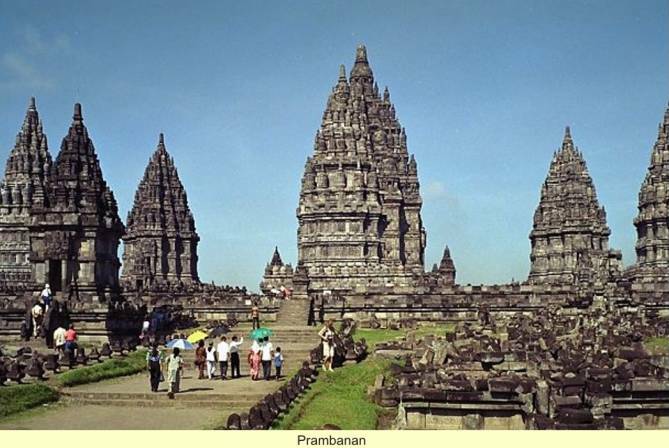 The Prambang complex originally contained 232 temples, many of which have already crumbled. The Lara Jonggrang was built on a square, surrounded by four walls with four large gates. The temples are subdivided into higher and lower terraces. On the higher terrace are major temples of Siva, Vishnu, and Brahma with three smaller temples dedicated to their animal vehicles. The temples of the gods are decorated with relief’s depicting the story of the Ramayana, one of the great Hindu epics. On the lower terrace are four sets of smaller temples, surrounded by a wall with four gates. There is also the Majapahit kingdom in eastern Java, which ruled much of the southern Malay Peninsula, as well as Borneo, Sumatra, Bali, and the Philippines from about 1293 A.D, to around 1500 A.D. Its greatest ruler was Hayam Wuruk. The golden era of Majapahit was however short-lived; the Empire began to decline after the death of its prime minister "Gajah Mada" in 1364 A.D. And it was further weakened after the death of its king, Hayam Wuruk in 1389 A.D. Added to that, was a war over succession that started in 1401 A.D, and went on for four years. Majapahit also had the added headache, of trying to control the rising power of the Sultanate of Malay. Finally in the 15th century A.D, the end of Majapahit came with the spread of Islam, and the rise of the Islamic states along the northern coast of Java. However a large number of courtiers, artisans, priests, and members of the royal family moved east to the island of Bali at the end of the Majapahit kingdom. Here they remained isolated, until the late 19th and early 20th centuries, when Dutch colonials mounted a military expedition, and took control of the islands.